Elsewhere on our blog we mentioned planting English Bluebells (Hyacinthoides non-scripta) rather than just “bluebells”. MCT has planted over 900 English Bluebell bulbs on the site in dappled shade areas. 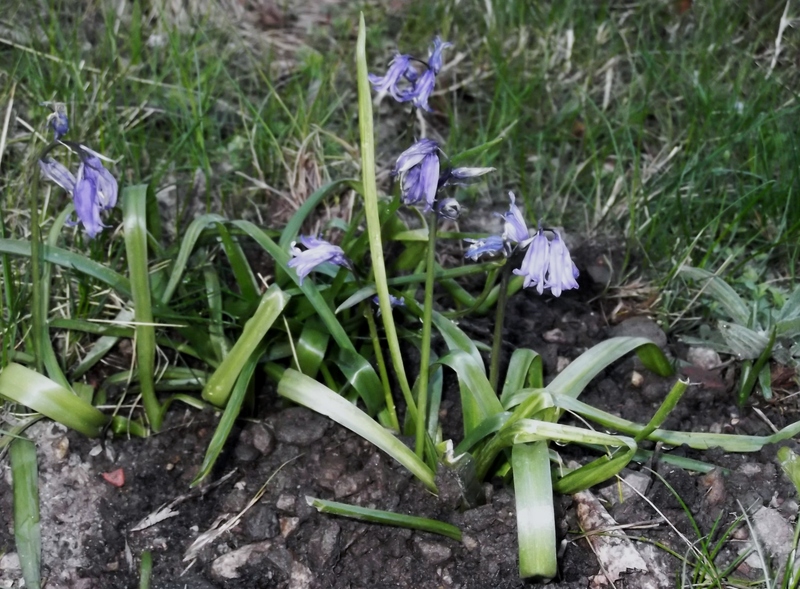 MCT is very keen to ensure that eventually all bluebells on the site of the native English type, but at present the highly competitive Spanish bluebell (Hyacinthoides hispanica) also occurs in small clumps at various places, and so do hybrids. Throughout Britain efforts are being made to restore and preserve the genetic purity of our native English bluebell while it’s still possible. The nicest way to distinguish between the two is to sniff. 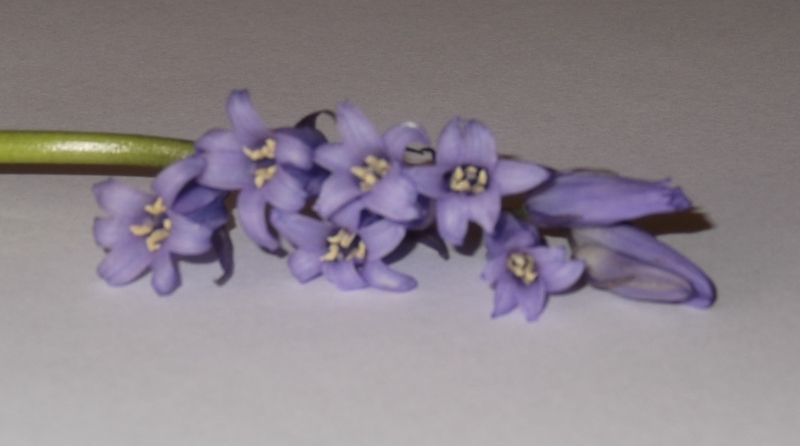 English bluebells have a beautiful delicate hyacinth fragrance. Spanish and hybrid varieties have little or no smell. and even without bias you might find the slight smell almost unpleasant. 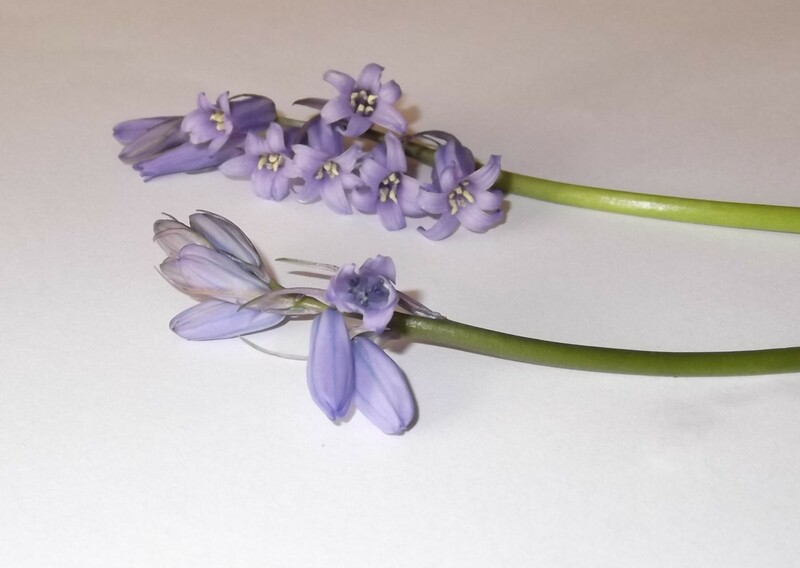 The upper bluebell is an English one, the lower one is a Spanish bluebell, both growing on the Mayfields site; note the blue pollen on the lowest flower in the freshly opened Spanish bluebell. Another difference is the pronounced recurvature of English bluebell petals (i.e. they curl back on themselves), as can be seen in the English bluebell images below. 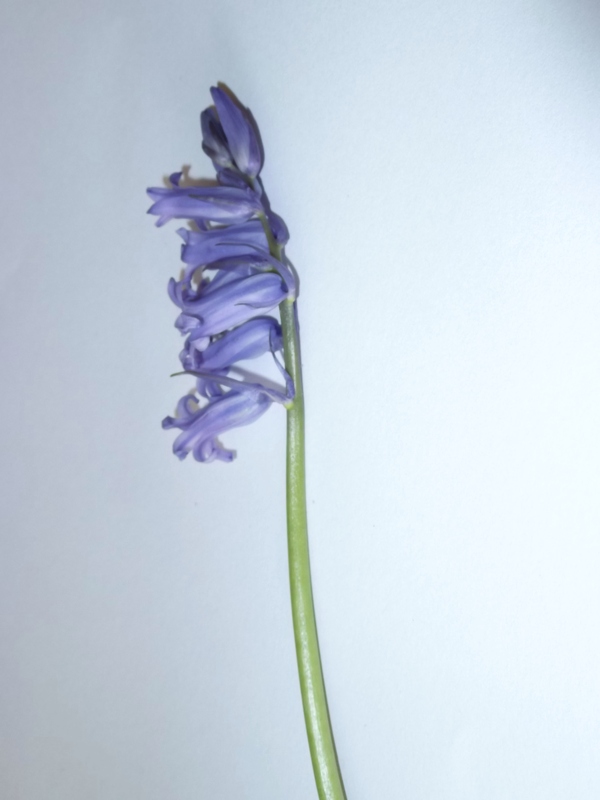 Note also how the flowers on the English bluebell lie to one side of the stem and often the top of the stem is droopy. The Spanish bluebell and hybrids generally have flowers around the stem and also often have broader leaves. Though they are decorative, if we leave them eventually the hybrids from seeds would almost certainly take over, and MCT wants to avoid this happening. If you’d like more information we strongly recommend the Natural History Museum web site, which currently has a short video on the subject. What should I do about Spanish bluebells growing in roadside verge only a few hundred yards from wood of English bluebells. For last few years I have snapped off flowers whilst in bud but the plants are multiplying. That helps reduce seed production and cross pollination Ruth, but ironically probably strengthens the bulbs for the following year. If you take the leaves and any regrowth too that will weaken the bulbs, but it has to be an on-going job as it will take a few years to have a really substantial effect. Every little helps though. We avoid using herbicides at Mayfields if humanly possible. Thank you very much for that. I hadn’t thought beyond stopping cross-pollination. I will cut back the leaves as well and hopefully perseverance will pay off eventually.